I think it's funny that people assume that I'm always good about eating well. That's not the case (I'm typically 100% primal at least 80% of the time – but that other 20% allows me to be Foodie first, Paleo/Primal second). In fact, last month I was really busy with some projects and found that I was eating a lot of fast food. I know. And my stomach is definitely aware of this. You know what it's like to have great habits and then have a few days of being tired and lazy, and then suddenly you're spiraling down the toilet? Yup, that is what I'm climbing back out of. My kitchen was out of fresh ingredients, which made the climb back out just that much harder. I didn't have any quick healthy snacks (thankfully I don't have any quick unhealthy ones either – probably the reason I kept hitting the fast food). This recipe. 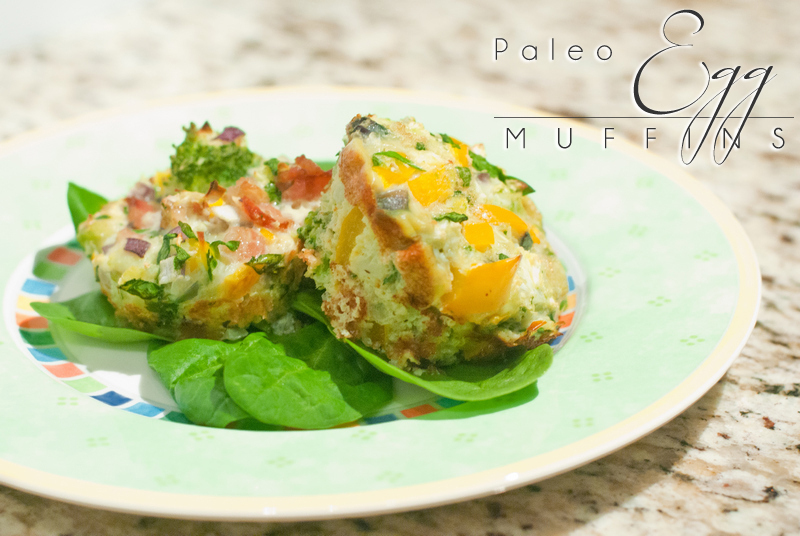 These Paleo Egg Muffins (or “frittata muffins” if you prefer) are helping me correct things. They're easy to make and super convenient to grab 2-3, heat, and add some Frank's RedHot Sauce (I know it sounds like I'm advertising for Frank's, but unfortunately they have not thrown any money at us – yet. I just love it #iptsoe). Suddenly I have a team. I'm accountable to not just myself, but also those who are encouraging me, and who I am in turn supporting. And things are going way better. I'm not just affecting change in my own life, but in others' as well! People power! This is what I've always wanted to do: lift people up and improve their lives. That's a big reason for the existence of www.ThePrimalDesire.com. Holley and I will continue to look for ways to connect with you and improve the world's health and quality of life. So connect with us via social media (there are links above, below, and to the right…). For now, I'm working on me and my close group. And I'm being fueled by healthy foods, like Paleo Egg Muffins, which are allowing me to better take on many of my other challenges. Whoop whoop! Do you have any goals that you're interested in dedicating time to for the next month and a half? Any habits that you need to correct? Tell us about the things you're stuck on right now, or your strategies for getting over temporary lapses. Grease a dozen cups in muffin tins (I recommend you use a cupcake liner to prevent eggs from sticking to the pan). In a large bowl whisk together eggs, egg whites, salt, and chilies. Add in cilantro, spinach, cauliflower, bell pepper, onion, broccoli, avocado, and any other vegetables that you wish to include (if adding additional ingredients, an extra egg may need to be added), and bacon. Stir gently. Fill each muffin cup to the top, but no higher. Bake for about 25 minutes (egg should be solid and edges should just start to brown). Allow to cool at least a couple minutes on a drying rack. Top with banana peppers, Franks RedHot Sauce, and/or cheese (if primal/lacto-paleo). The most important step: take photos of final product and share them with us and the world on Facebook, Twitter, Instagram, or Pinterest! 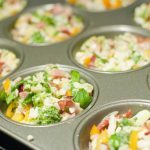 Do you ever use silicone muffin tins? Thoughts on them? I don’t have any (I don’t bake much), but based on the things ive eaten that ither people have made, I’m a fan. 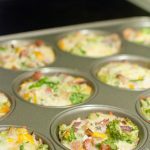 Making these frittatas in the silicone muffin tins make it really easy to pop them out. No need to grease them in advance. You might need to ask Santa for some! Sweet. Good to know. Cause I didn’t use cups and it’s been a pain to get the tins clean. I love silicone trays, and use them for so many things besides baking! 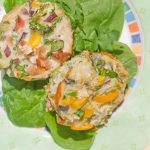 These frittata muffins look very appealing. I love the variety of veggies and colours! Always looking for delicious ways to increase my colorful veggie intake. Definitely agree, food is life, and you need to be able to enjoy indulging in your “cheat” foods periodically – without guilt. Cauliflower, one of those things I always thought was just a vehicle for cheese sauce. But now it’s “rice“, mashed faux-tatoes, pizza crust, hummus, etc. Such a great, handy, healthy breakfast! And cute, too. Love the addition of shredded cauliflower for some extra veg power. It’s one of those tricky ways of hiding vegetables in food that you don’t even realize. It is very easy to turn to fast food when you don’t have any healthy groceries in the house and especially when fast food is so easy to get. 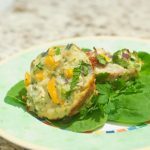 These little healthy and easy muffins are a great breakfast idea, especially for those who are on the go. 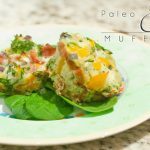 I have seen many recipes for these around the internet but I like how there is now a paleo recipe. Have you tried any other ingredients than the ones you have listed? Did you include bacon in yours? Also have you tried using a silicone baking tray like others have commented or just a metal one and used muffin cases? Good day sir! BTW, since posting this recipe my diet has improved drastically! The one I had tried before paleoizing was a quinoa based one which is what I figured the cauliflower would work well as a replacement for. I tried these with multiple ingredients (most of which are in the optional ingredients list), and definitely tried with and without bacon (so the bacon recommendation is based on the difference- both are good, but one has bacon in it and the other doesn’t. Nuff said). I don’t typically bake, so I myself have not used the silicone cups but I have eaten from them. I highly recommend using cups, either paper or silicone. To be honest I’m still trying to clean the muffin tins I used without using cups. How can baked egg cause so much difficulty?!? If you have any tips for cleaning them, please share…. I can imagine your diet has improved Raj. I think once you find simple and easy recipes, you’re not encourage to pick up the phone or go to the local fast food restaurant when you hardly have any groceries in the cupboards or if your not in the mood to cook anything big. Bacon can also give extra flavour rather than just having all vegetables, but a great way to get your 5 a day packed into one little frittata. After your experience with the baking try I think I will try the cups or purchase a silicon tray. I can’t say cleaning is my strongest point but from tips on the web, soaking the tray in hot soapy water with a little bit of detergent can sometimes help to get crust or burnt spots off any pans or baking trays. Yeah… I’ve tried that. I think I’ll be replacing this tin…. I have to start making things like this for breakfast. I’m getting tired of oatmeal! Thanks for trying out the recipe. Sorry to hear that your experience waa less than awesome. Looks like there was some instructions lost in translation there. Obviously if you omit the bacon you’ll be lacking in flavor, but if you use bacon, which is salted, as written, then adding additional salt would be excessive. Keep in mind when altering recipes that your result isn’t going to be the same. But you sound capable of adding what your tastes require, and we encourage you to experiment. Also, I’m not sure if you’re saying you separated all the eggs and only used 3 to start? The recipe calls for 3 eggs + 3 egg white. This would account for your volume discrepancy. I’m not totally sure why you had to let everything get cold before you ate it, and I don’t think there was any specific liner that was recommended in the recipe. If I had, I would have recommended reusable silicone liners, though I personally did use paper ones after totally destroying a muffin tin when I made this without them the first time. The extra fat from the bacon also helps prevent the paper cups from sticking to the egg muffin. I hope that addresses your concerns. Don’t get discouraged: the best lessons come from the mistakes.